Emily Robinson hit the black carpet at the Nylon Young Hollywood May Issue Event yesterday evening(May 2nd) at Avenue in LA. 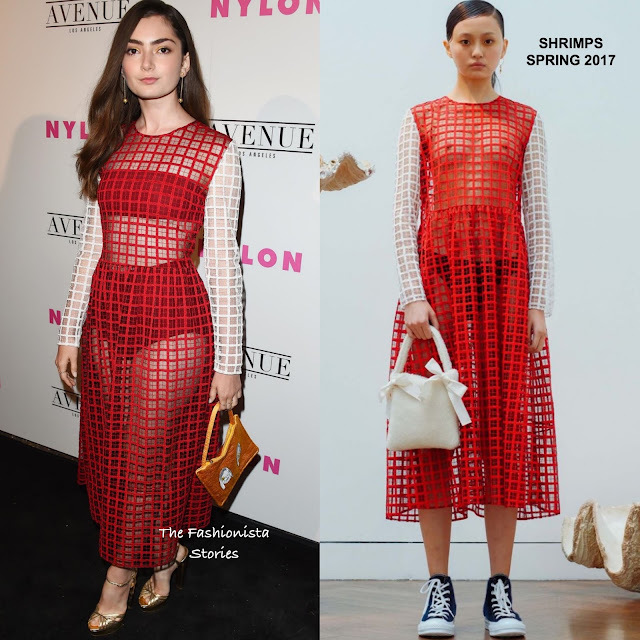 Showing some skin, she wore a see-through white long sleeve & red grid patten SHRIMPS SPRING 2017 midi dress with a black bra & briefs underneath for coverage. Minus there not being any coverage underneath, I really love how this dress was styled in the look book with the white bag & converse sneakers. However she does look nice in this dress. She finished up with YOSSI HARARI earrings, ILEANA MAKRI rings, a gold bag & sandals. What do you think of Emily's look?